Bi-Office Magnetic Glass Mobile Easel W700xH1000mm GEA4850116 – BQ50850 – OfficeYoo! This unique, stylish Bi-Office Mobile Easel has a magnetic glass surface for professional presentaions and reports. Write directly onto the drywipe surface, or use the adjustable clamp to add a standard flipchart pad. The 2 magnetic extension bars allow you to display up to 3 sheets at once and the 5 star base with locking castors allows both mobility and stability when in use. The safe tempered glass is 4mm thick and provides a smooth, polished surface, which wipes clean easily. 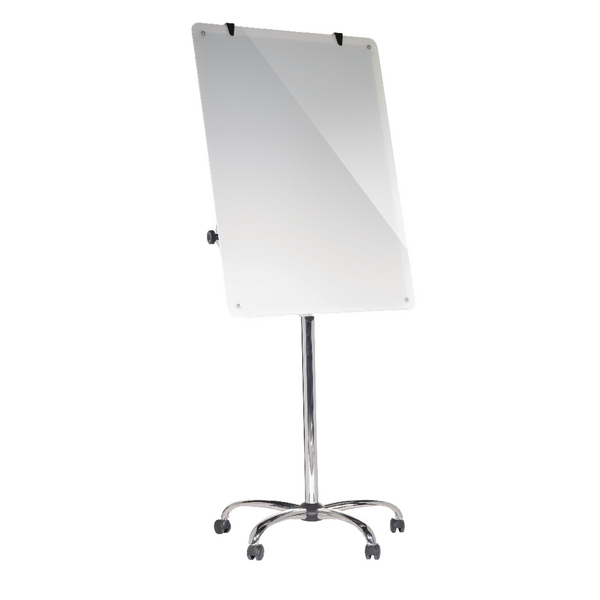 The easel also features a robust chrome structure with a metal tray for pens and other accessories. This white glass board measures W700 x H1000mm.